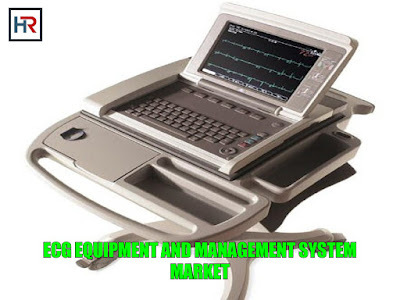 The Global ECG Equipment and Management Market is expected to reach USD 7.63 million by 2025, according to a new report by Hexa Reports. Increase in geriatric population across the world coupled with rise in cardiac diseases are likely to drive the market during the forecast period. Furthermore, increase in investment by various market players and government agencies for development and commercialization of various sensitive and easy-to-use equipment is likely to drive market growth. For instance, in April 2017, CardioComm Solutions, Inc. entered into a conglomerate with CareSpan USA Inc. to incorporate CardioComm's cloud-based ECG analysis tools into CareSpan's Virtual Clinic. This would help in remote analysis of 1, 3, and 12 lead ECG data for online patient care. In September 2017, the U.S. FDA approved app-driven, easy-to-clean, and fully reusable ECG device manufactured by NimbleHeart. The device wraps around user's torso and is used without electrolytic gels and adhesive. Hence, the device can be cleaned easily, thereby, making the product ideal for multipatient use. • Resting ECG system segment accounted for the highest share of the market and is expected to witness significant growth during the forecast period. This can be attributed to the availability of several commercial products and improved clinical accuracy due to advanced data analysis tools to detect heart related problems. • Management system segment is witnessed to be the fastest growing segment in the forecast period owing to introduction of innovative products such as mobile access to waveforms, ease of use, and increased efficiency. • Geographically, North America was the major contributor in the ECG equipment and management market in 2016. It is anticipated to maintain its dominance during the forecast period due to demand for portable monitoring & diagnostic devices, adoption of new technologies, and product launches. • The market in Asia Pacific is likely to witness significant growth over the next decade owing to increasing investments and entry of key market players in the region, and growing healthcare expenditure and disposable income, in major markets, such as Japan and China. • Some of the key players are BioTelemetry, Inc.; Compumed Inc.; GE Healthcare; Mindray Medical; Hill Rom; NIHON KOHDEN CORPORATION; Philips Healthcare; Schiller AG; Spacelabs Healthcare; Welch Allyn; CardioComm Solutions, Inc.; McKesson Corporation; Device Technologies; and Meditech.